This was an extra special year for us. 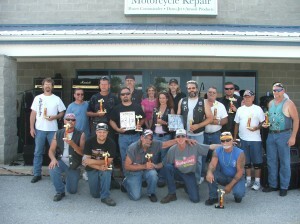 Not only were we having our 6th annual motorcycle show, but we also turned it into our 5th Year Anniversary party! I had been monopolizing the decision for where the donations would be going to so Jan stepped up and stated that he would like to make the choice for this year. A good friend’s wife has MS, therefore Jan wanted this year’s fundraiser to go to The Multiple Sclerosis Society. We had a lot more going on this year and started making plans much earlier in the year. We contacted all the organizations and asked them to come up with carnival type games to entertain the crowd. We had a burn out pit that year and the Discovery Channel Bike built by Gypsy the first woman participant. West Plex 100.7 provided a live broadcast early in the day with “The Beau & Katy Show” with music from Stray Bullet for the rest of the day. I believe it was an extra hot summer day, but everyone still came out and fun was had by all.